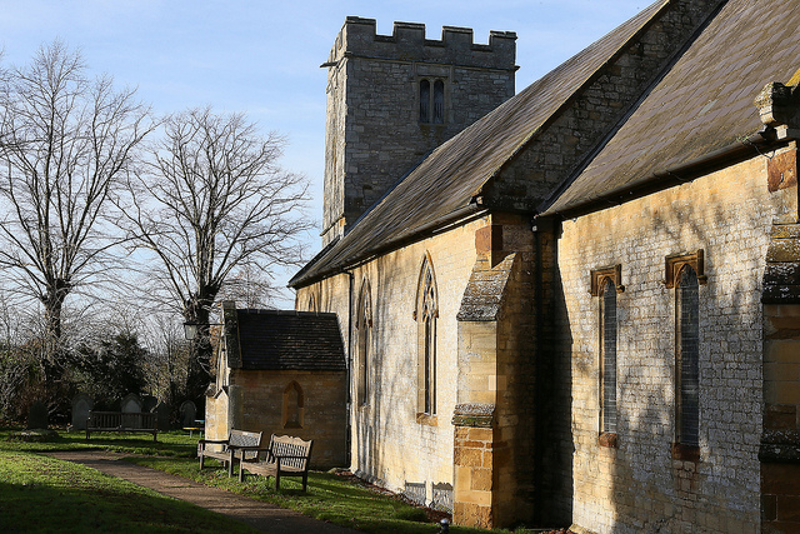 The church is dedicated to Saint Margaret and is the parish church for Alderton, Northamptonshire. Although there is evidence of an earlier and much larger church on the site, the current building was almost entirely rebuilt in 1847-8, with the exception of the west tower, which is late Perpendicular. The fabric is of coursed squared limestone, with slate roofs. It consists of a west bell tower, south porch, nave with minstrel’s gallery, and chancel. The two-bay chancel has a three-light east window, with nineteenth century curvilinear tracery and hood mould with label stops; a pair of one-light windows to the south with straight heads, cinquefoil-headed lights, cut spandrels and hood moulds; and diagonal offset buttresses. The interior of the chancel has ogee-arched blank arcading to the east end; and a wooden altar rail. The chancel arch is double-chamfered, the outermost being continuous and the innermost resting on corbels. The chancel and nave have hollow-chamfered stone eaves and nineteenth century arch-braced collar truss roofs. The nave has six two-light windows with Decorated style tracery and hood moulds with label stops; and diagonal off-set buttresses. The south porch has chamfered doorway with hood mould and the south door has hollow chamfer and wave moulding. The tower arch is double-chamfered, with polygonal responds. The two-stage tower has one string course, two-light west window with segmental-arched head and hood mould at the lower level; two-light bell-chamber openings with straight heads and hood moulds; and a battlemented parapet. The fourteenth century octagonal stone font, which has a bowl and stem in one, has cusped blank arcading with a foliage frieze, depicting heads of angels. There is a three-decker pulpit, though the reading pew and clerk’s desk were later additions tacked on to the original Jacobean pulpit and are in a different style. The original hexagonal pulpit, which dates from 1631, has a tester: the sounding board is decorated with winged cherubim heads and the back panel is inscribed: ‘I the Lord will meet thee in this place and tell thee what thou shalt saye to the people.’ The inscription is adapted from the biblical book of Exodus chapter 25, verse 22 and the decoration is inspired by the description of the mercy seat in the same chapter. The seating in the church is provided by pews, which sit on top of wooden pew platforms. There is a mixture of open pews, high sided pews with doors and box pews. The pews at the rear (west end) of the nave have mostly been removed, but the pew platforms remain. The date the pews were introduced is unknown, but it is presumed that they date from the mid 1800s, when the body of the church was rebuilt and are therefore early Victorian. Alternatively, they may have been installed earlier, together with the reading pew and clerk’s desk elements of the three-decker pulpit and the minstrel’s gallery, as part of an ongoing post reformation modernisation programme and retained when the church was rebuilt. There are two choir stalls in the chancel, one on the north wall and one on the south. They are made up of a number of disparate pieces of joinery, most presumed to be the same date as the pews in the nave, some earlier and some quite recent. Among the small number of monuments in the church is a rare oak effigy of a cross-legged knight, of good quality, believed to be Sir William de Combemartyn (d.1318); a brass plate in moulded stone surround to Sir John Heselrige, third son of Sir Thomas Haselrige (Baronet, d.1655), with Latin inscription, arms to left hand upper corner and crest to right, which is located on the north wall of the chancel; and an 18th century (George lll) royal coat of arms. A memorial window to B. J. Sams was presented by his daughter in 1886 and is located in the chancel. Treble, cast by John Taylor & Co. of Loughborough in 1848. 25 5/8” diameter, 2cwt 3qqtrs 18lbs. 2nd, recast by Alfred Bowell in 1923. Originally cast by Henry Bagley in 1670. 27” diameter, 3cwt 3qtrs 24lbs. 3rd, cast by John Ruffard in around 1365. 28 3/4” diameter, 3cwt 3qtrs 13lbs. 4th, cast by John Taylor & Co. of Loughborough in 1848. 30 3/4” diameter, 4cwt 0qtrs 10lbs. Tenor, cast by Henry Bagley in 1670. 36½” diameter, 7cwt 2qtrs 23lbs. The churchyard surrounds the church on all sides. It is bordered on two sides by a stone wall and banking, where it is on higher ground than the surrounding land: Church Lane on one side and a privately owned paddock on the other. It is bordered by hedging on the other two sides, where it adjoins privately owned homes, as well as iron railings on the Round House side. Paths run to the porch from each of the two entrances: the main gate on Church Lane and a side gate adjacent to the Round House, which connects the church to Pury Road, the main road through the village, by a gravel path. There are sixteen mature lime trees around the perimeter of the churchyard, which are subject to tree preservation orders. These require regular pollarding in order to prevent them from growing too large. The grass is mostly mown short, but there is a section to the north where the grass is allowed to grow longer in order to provide a habitat for wildlife. A few gravestones still exist, including a cross stump, as well as a small number of cremation memorials and many of the graves are still cared for by family members. The churchyard is still used as a burial ground and is open for burials of bodies as well as cremated remains.